Some women are luckier than others when it comes to pregnancy. Meanwhile, others get the unfortunate brunt and full force of the hormone cocktail that comes with expecting a baby. Former country singer Jessica Simpson is one of them. Simpson was very open about the struggles she faced while still carrying her newborn daughter, Birdie Mae. The 38-year-old mother of three and entrepreneur has taken to updating her 4.6 million followers on Instagram about her pregnancy woes. Just around two weeks before her due date, Simpson said that she got bronchitis again (for the fourth time in the span of two months, actually). Fortunately, the then-pregnant Simpson was able to recover after a week in the hospital. Aside from the respiratory illness, she also reported experiencing extreme swelling in her extremities and severe acid reflux during her nine-month ordeal. A screencap of a photo of Birdie Mae and, older sister, Maxi, posted by Simpson on Instagram to announce the birth of her third child. Still, Simpson is glad to welcome her new baby into the world and is hyped to start her recovery process. 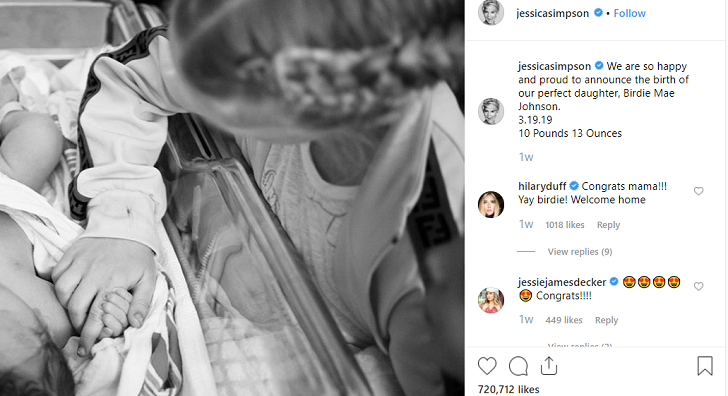 Her husband, Eric Johnson, and her two older kids, Ace Knute and Maxi Drew were also excited to finally see their new baby sister. According to a close friend of Simpson’s, the couple’s newborn daughter is a record-breaker in the family. Apparently, before Birdie Mae came, Maxi held the title as the ‘biggest’ baby in the now family of five weighing 9 lbs and 13 oz. when she was born. She has now been dethroned by her baby sister who weighed a heavy 10 lbs and 13 oz at birth. The youngest member of the Simpson-Johnson family was born last March 19 via a C-section. Simpson before and after losing the baby weight brought by her second pregnancy. While Simpson definitely gained a lot of weight while carrying Birdie, the star seems confident that she can shed off the pounds again. For starters, she’s quite the veteran when it comes to getting back in shape. It can be remembered that Simpson became an inspirational figure for regular women when she successfully lost weight after her second pregnancy left her 60 pounds heavier. The fantastic makeover was a product of healthy eating, working out and lifestyle changes facilitated by her trainer Harley Pasternak. Pasternak said that he put the star on a Weight Watcher’s point system eating plan and required her to exercise for at least three to four sessions in a week. Each workout lasts for about an hour each and involves 20 minutes of cardio followed by an intense 45-minute session of strength training. She also incorporated the Five Factor Diet into her weight loss plan. The plan required her to eat five meals a day. Sounds easy? Here’s the catch, the plan restricts you to using only five ingredients for each meal and to cooking it under five minutes to boot.